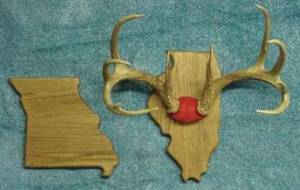 Add a unique touch to your trophies and your trophy room with these State Shaped Trophy Plaques! 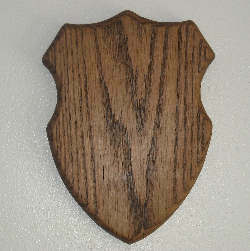 Hand-crafted from real hardwood, they will add a distinctive look to your home, office, cabin or RV. 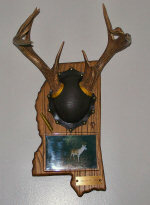 Order yours for that once in a lifetime trophy fish or for those antlers collecting dust in your garage. All states, Canadian provinces and special designs are available. 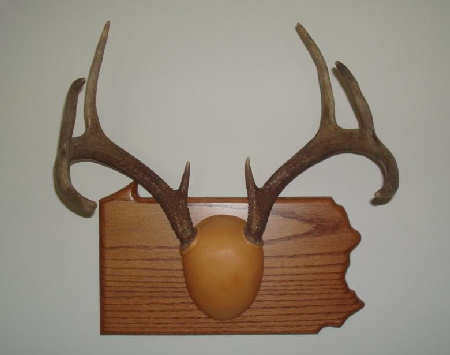 If you want the plaque for a European Skull Mount, go Here for details. Add a gloss clear-coating to your plaque for Only $10.00! To order by Check or Money Order simply choose that payment method during checkout. Then print order and mail. It's that easy! Click Here To View Shipping Rates. Make sure to specify the state desired in the comments section on the order form. 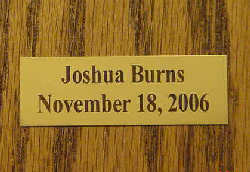 All of our plaques are made to order, please allow up to 3 weeks for delivery. Longer for larger orders. Remember that ALL states are available. Just because you don't see your state listed doesn't mean we don't make it. It only means that we haven't made it, yet. Be the first! Approx. Size: 1" high x 3" wide. Now you can add all the information about your trophy with our Trophy Tags metal placards! Made from brass with black lettering, they will add that final touch to all of your trophies. Easy to install! No holes to drill or nails to drive! They conveniently stick on! 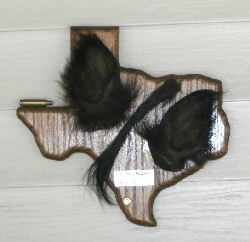 Offered in two sizes; 1 1/4" x 3 1/4" with three lines of text or 1" x 3" with two lines of text. We'll contact you after receiving your order to get your information for your placard. Order yours for only $15.00 each! Sizes: U.P.- 13 1/2" wide x 7 1/2" high. 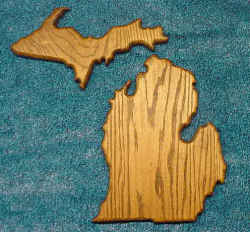 Lower - 11 1/2" wide x 14" high �Complete your Michigan Plaque with an Upper Peninsula Plaque. 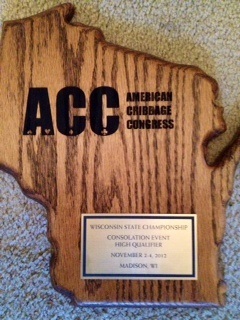 This plaque will compliment your existing Michigan Plaque and make a distinct impression in your trophy room. �They are made from solid oak with handcrafted skill and scaled to match the lower half. Order yours for only $29.95!